It has been seven years since the 2nd siege of Fallujah — the American assault that left the city in ruins, killed thousands of civilians, and displaced hundreds-of-thousands more — the assault that poisoned a generation, plaguing the people who live there with cancers and their children with birth defects. I know, because I am one of those American veterans. In the eyes of many of the people I “served” with, the people of Fallujah remain dehumanized and their resistance fighters are still believed to be terrorists. But unlike most of my counterparts, I understand that I was the aggressor, and that the resistance fighters in Fallujah were defending their city. I do not see any contradiction in feeling sympathy for the dead American Marines and soldiers and at the same time feeling sympathy for the Fallujans who fell to their guns. The contradiction lies in believing that we were liberators, when in fact we oppressed the freedoms and wishes of Fallujahs. The contradiction lies in believing that we were heroes, when the definition of “hero” bares no relation to our actions in Fallujah. 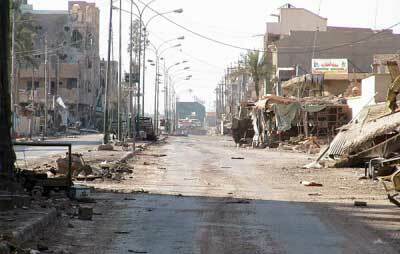 What we did to Fallujah cannot be undone, and I see no point in attacking the people in my former unit. What I want to attack are the lies and false beliefs. I want to destroy the prejudices that prevented us from putting ourselves in the other’s shoes and asking ourselves what we would have done if a foreign army invaded our country and laid siege to our city.